Face of Camp Jitterbug 2010! And what a pretty face! Oh dear me! And this year the Jump Session show will feature all six Killer Dillers! Myself and Juan, Kevin St Laurent & Jo Hoffberg, and Evita Arce & Nathan Bugh will all be attending Camp Jitterbug, to show off our new routines in the Jump Session Show, jump in the competitions (like last year’s ILHC, it’ll be The Killer Dillers vs Everyone Else in the Charleston battle – be there or be square! ), and we’ll also be teaching some classes! Camp Jitterbug is without a doubt one of the greatest events on the international Lindy Hop calendar, so if you can make it I’d really recommend it! My DVDs are finally available! My burlesque company in Australia, Sugar Blue Burlesque, has just released a series of five instructional DVDs, including a 3-volume Burlesque series (featuring myself, plus the other Sugar Blue Burlesque instructors! ), as well as my very own “1920s Charleston & Other Vintage Jazz Dances” DVD. The Charleston DVD includes vernacular jazz and blues dancing, as well as, of course, 1920s Charleston, and has the fundamentals as well as advanced steps. The DVDs are available for purchase online at the Sugar Blue Burlesque website for $30.00 each, and that’s Australian dollars, so take advantage of the exchange rate! Right now, that’s only US$25, or €18 Euros, or £15 GBP! Shipping is available worldwide. Click here (or on “DVDs” in the menu bar above) to find out more! It’s a blog and look book, about swing fashion – both swing era vintage (1920s, 30s & 40s), and also those special fashions that sweep through the swing community around the world, completely independently of the fashion world at large! We’ll be taking photos of the well-dressed folk at all the swing dance events we go to around the globe, and posting them up on the blog, as well as vintage photos that inspire us and anything else related to vintage fashion, hair and makeup of the jazz age. What is Lindy Hop and why’s it so special? Here is an article I wrote for AusDance magazine a few years ago. It’s more of an academic/professional magazine, read mostly by dancers in other styles (especially contemporary, classical and ballroom), who in Australia don’t tend to know much about Lindy. So it’s essentially a brief introduction to what Lindy Hop is all about and what makes it stand out from other danceforms. By definition a swing dance is danced to swinging jazz, a musical style popular in the 1930s and 40s. This is what differentiates Lindy Hop from dances like Rock ‘n Roll, Rockabilly, Jive, West Coast Swing or Ceroc – these dances all evolved out of Lindy Hop over the decades, and they are all danced to other types of music. 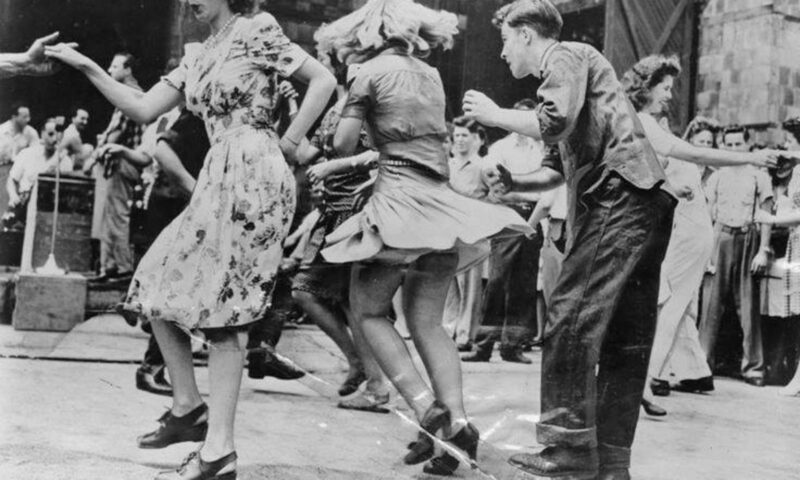 Lindy Hop is the original swing dance. Of course you can dance Lindy Hop to other music too, but it will never feel as fantastic as dancing to music with a swinging pulse. Lindy Hop evolved alongside jazz, so it echoes the nature of the music. Swing dancers are musical – this means that they listen to the music and interpret it spontaneously into dance form, regardless of whether they know the song or have never heard it before. Like jazz, Lindy Hop is based on rhythms and syncopation. Lindy Hop is all about tactile communication with your partner, through a physical connection that continues regardless of the position you are in (Lindy Hop includes all variety of open and closed formations). Once you’ve learned some fundamental connection and lead/follow techniques, you can dance with anyone. Through this connection followers are able to intuitively follow moves even if they’ve never done them before, and this communication conveys to her the spaces in the dance free for her own improvisation. Leads have control of their partner’s movement and can therefore manipulate the dance spontaneously, to react to the music or to flow one figure organically into the next. This connection and communication is hugely satisfying, and every dance becomes a conversation. Learning the connection, counter tension, frame and lead/follow techniques of Lindy Hop will put you in good stead for any partnered dance. Like jazz music itself, Lindy Hop has a highly improvisatory nature. That is, not every step is defined or choreographed. The best dancers are those that can improvise their dancing in a way that reflects the music – and improvisation isn’t just for the leaders! 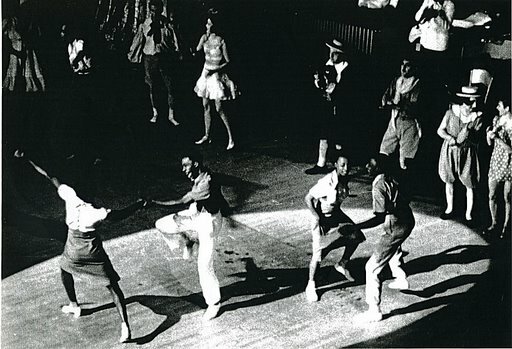 A unique feature of Lindy Hop is the freedom of expression available to the followers, who aren’t merely locked into the movement defined by the leader, but actually have space and time within the Lindy Hop framework to improvise movement and styling. When two dancers are feeding off each other’s improvised movement and style, a ‘call and response’ relationship (again, just like in jazz itself) is created. Unlike many other dance forms, Lindy Hop is all about developing your own unique style. One swing dancer might look completely different to another, even though they are doing exactly the same step. There are a number of character styles (and an infinite number of unique individual styles), but it’s all Lindy Hop – the fundamentals are the same, the same connection and communication is there and all Lindy Hoppers can dance together, regardless of style. With good technique, your styling and improvisation won’t interrupt the connection to your partner, so the opportunities for individual expression are endless – you can be as acrobatic or as smooth, as wild or as graceful as you like. Lindy Hop is above all a social dance (as opposed to an institutionalised or standardised ballroom or classical dance). It evolved organically alongside swing music in the social atmosphere of the American ballrooms of the 1920s, 30s and 40s, and this social spirit remains. You don’t need a dance partner to learn (classes rotate partners) and you don’t need to achieve any particular skill level before you can start social dancing – all levels dance together. Both men and women ask each other for dances, and it’s generally accepted that social dancing with a variety of partners is the best way to improve your Lindy Hop fast. There’s also a universe of swing culture to immerse yourself in. Swing dance communities are home not only to fans of the dance, but also to passionate jazz and swing music devotees, as well as enthusiasts of the history and fashion of the Swing Era. And of course, swing dancing doesn’t end at Lindy Hop. There are a variety of jazz and swing era dances, such as Charleston, Balboa, Collegiate Shag and Big Apple. If you still want to spread your wings, swing dance is an international phenomenon, with camps and exchanges in Europe, Asia and the USA, with a huge online community to make contacts for your travels. Many swing dance schools and societies also fly in international teachers to give workshops for local dancers. Lindy Hop is an addictive and hugely satisfying dance, and Australian swing dance communities are known for being some of the most warm and welcoming in the world. Take a class, and it won’t be long before you’re in love with Lindy Hop too.